Two Restaurant industry heavyweights shared their unique, investable insights on which stocks are poised to win and lose in the months and years ahead. In this exclusive webcast, Hedgeye Restaurants analyst Howard Penney and Restaurants journalist Jonathan Maze, Executive Editor with Restaurant Business Magazine, discuss numerous big restaurant stock winners and losers along with the key sector trends that are rapidly changing the game in the restaurant industry. Howard Penney: Welcome Jonathan. I want to start with a simple question that probably doesn’t have an easy answer. 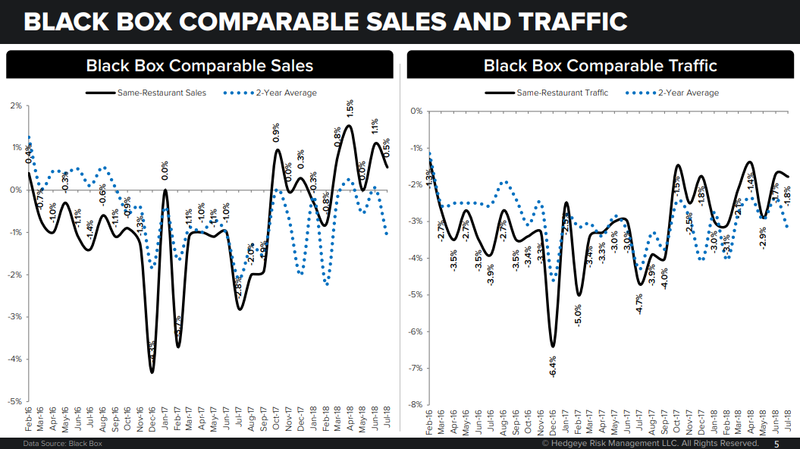 Why isn’t restaurant traffic stronger? Consumer confidence is high, unemployment rate is low, wages are growing, so what’s your take on restaurant traffic these days? Jonathan Maze: If you think about it, restaurants have spent the last 10-plus years building new locations, starting new concepts, and we’ve had a lot of money flow into the sector year after year. Lending is readily available for just about everybody. All of this has generated a feeding frenzy in the restaurants space. But the thing is, when consumers have a lot of choices, they make them. That’s essentially what’s happened. We’ve had same-store traffic weakness for the last decade and consumers are simply using their wallets to make choices. And any company that doesn’t do their job well is struggling to generate same store traffic. Penney: Retail sales are showing a surge in spending recently. So consumers are out there and spending but, to your point Jonathan, there are just too many stores and not enough good ones. You can see in the Black Box data, notably, a pick-up here in November of 2017 to the present in comparable sales. That’s partly due to pricing and to a certain degree the Trump tax cuts perhaps. But traffic, as you can see, is still not doing well. Penney: The next topic from a macro perspective is wage inflation. This is going to be one of the more difficult issues the industry is going to face. There’s good news and bad news. You’ve got wage inflation which is putting money in the pockets of consumers, but it’s also putting pressure on the P&L of these restaurant companies and that’s forcing restaurants to raise price. This creates a bigger premium in the cost of going out relative to going to a supermarket. So Jonathan, how does the industry deal with this and not only inflation but also the supply issue? Maze: The industry has to get more efficient. The fundamental problem with the restaurant industry today is that it’s a very inefficient method of delivering food to consumers. If you compare it with convenience stores and grocers, their primary competitors for food dollars, restaurants spend a lot more on labor. Now, it’s obviously an industry that’s a lot more experiential, but restaurants need to improve their efficiency. Wage rates are going up in an industry that spends a third of its revenue on labor, so it’s becoming less profitable from a competitive standpoint. Penney: I want to talk about delivery for a second, because it’s changing the industry. Darden Restaurants (DRI) and Texas Roadhouse (TXRH) are taking a wait-and-see approach to delivery. Now, I would argue they’re probably two of the best-run concepts today. Texas Roadhouse probably gets the gold star, with positive traffic in an industry that has negative traffic. 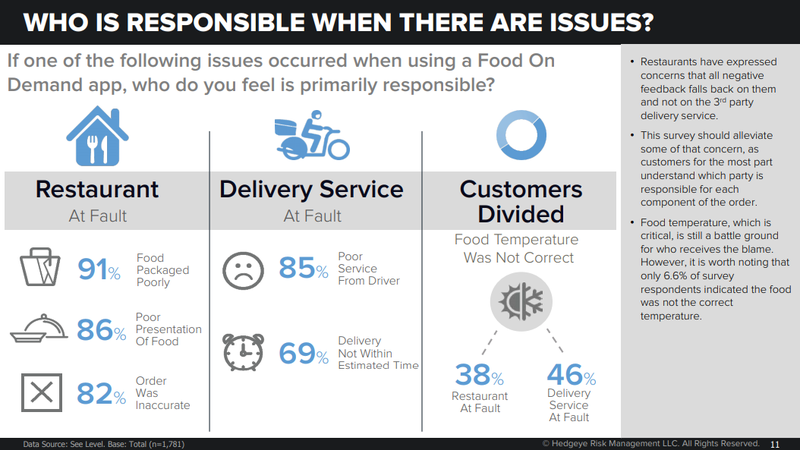 Now, you can argue that these best-in-the-business operators must see something in delivery that they don’t like. Now the obvious thing is they don’t want to pay 15-30% to the aggregator to get the food delivered. And on the other side of this are the companies going after delivery like Applebee’s. Not that the market is correct, but the market is telling us something with GrubHub (GRUB) at $ 140 today and a $ 13 billion valuation that there is going to be a big shift to delivery. Furthermore, you have private and public companies talking about 20% of sales going to delivery. I would argue there are two points to make here. One, if 20% of your sales go to delivery and you have to pay 15% fees, that’s a problem. And then the second thing is who’s responsible when there are issues? It’s really going to be tough when a company is putting their brand in the hands of a third party. There’s certainly going to be some risk. I don’t think the consumer is going to give the brand a pass for cold fries or a cold burger. Penney: Let’s have some fun with some names. I’d like to go through McDonald’s (MCD) first. 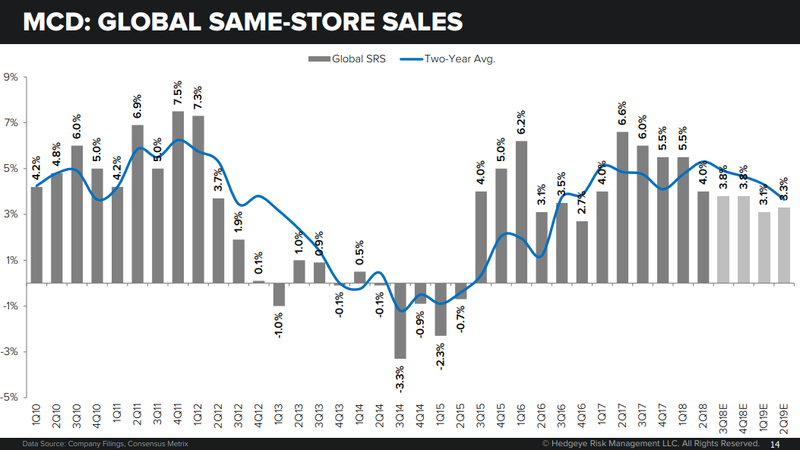 We have McDonald’s same-store sales on this slide. Now, you can see the pick-up in sales in 3Q of 2015. McDonald’s CEO Steve Easterbrook came in a few months before that in late 2014, early 2015. He simplified things in 2015. As you can see, the menu size went from 108 to 72. Now the menu size is going back up again. Promotions also went down from 2013 to 2015, and now the promotions are going back up. I see promotions and menu size going up, causing a slowdown in drive-thru times. Now, 70% of business goes through the drive-thrus. Jonathan, I’m making my bear case for McDonald’s right now, and you can choose to comment or not. But my thesis is that growth creates complexity and complexity is the silent killer of growth. Are things like Technology able to save McDonald’s? Maze: Finding ways to add technology to a restaurant to improve efficiency, that’s a good thing. Using the tools available to improve your business is a good thing. Fresh beef should be a good thing. Adding delivery should, in theory, add incremental sales because you’re adding more ordering offers. This could point to a McDonald’s that offers consumers a better experience and gives them better tasting food. But it’s also asking their franchisees to do an awful lot. And that’s the issue of complexity that I think you’re talking about. The danger to me has not been these individual things but that they’re doing them all at the same time. Penney: I agree with you. The technology kiosk that they’re putting in their stores, there’s an intended consequence of that and that is they want to reduce labor over time. So they want to shift the consumer’s behavior to ordering at a kiosk from ordering from a person. Now that will take time, years to happen. But they just can’t afford to pay the person taking orders $ 15 an hour. The CEO of McDonald’s will never say that publicly for obvious reasons. Penney: Complexity is clearly a theme of mine, and I’m going to stick with that here talking about Starbucks (SBUX). On slide 19, you see the Starbucks American same-store sales and you see sales in 1Q 2016 posting 9% growth and 1% growth by 3Q 2018. This is another complexity story as their ticket times have gone down. They’re serving food and trying to sell more to consumers. If you look at the menu trends, total menu items are up a lot. If you look at menu trends and correlate that with sales and promotions, when menu items go up, sales go down. Now this is my Howard Schultz slide, where he came back when Starbucks was struggling after he left. The company cut capital spending because they were growing too fast. 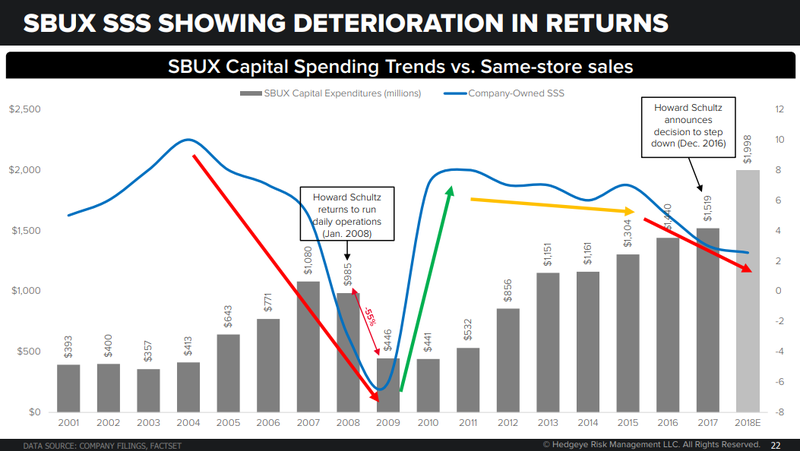 And then he left at the peak of capital spending again as sales were slowing. So now once again he’s left the ship drifting along with a CEO who doesn’t look like he’s ready to take the right steps to fix the sales trend. What are your thoughts Jonathan? Maze: I think they might need to slow down again. They’re adding units at a pretty rapid pace. They just overtook McDonald’s as the second most unit heavy restaurant chain in the U.S. And that unit count tends to get concentrated in very specific markets. It’s not spread out. That’s one of their issues. Complexity is definitely a concern. Starbucks same-store sales are definitely slowing. So I agree with you that complexity is hurting their service times and it’s hurting their traffic.